We're sorry but all Type / Material combinations for this product are currently out of stock. You can be notified upon their arrival by choosing the Type and Material options you are interested in and then entering your email in the box below. Arlen Ness, the "King of Choppers," knows a thing or two about performance. The Big Sucker is designed to give your engine maximum airflow for maximum performance. Testing shows that by simply installing a Big Sucker kit, horsepower gains of up to 21% are attainable. Big Sucker kits feature patented, hidden breather backing plate technology - this means the breathers are incorporated into the air cleaner housing itself. Gone are unsightly external hoses and hardware, giving your bike a super-clean look. Each hidden breather has a sealing O-ring at the heads and exits at the carburetor or throttle body inlet to provide efficient internal engine pressure relief. The Standard air filter elements are made one at a time using the finest materials available. Standard filters are all pre-oiled, and feature four layers of surgical-grade cotton to promote airflow and filter air effectively. The Synthetic Stainless Jacketed filter features a synthetic material that is water resistant and never needs to be oiled. Just wash and re-use. The mesh supporting the gauze is made of a rust-resistant stainless steel as opposed to standard carbon steel, and the synthetic filtration gauze is in black or dark grey, rather than the pink/red hue of the Standard Filter. The filters are hand-poured one at a time in a urethane body, unlike many other filters that are spun, which can leave a residue on the filtration media. All kits include a Big Sucker backing plate, high-flow filter, chrome banjo bolts, gasket, hardware, and simple instructions. Made in the USA. Note: Air cleaner images are for reference only. All kits on this page will include filter of your choice. 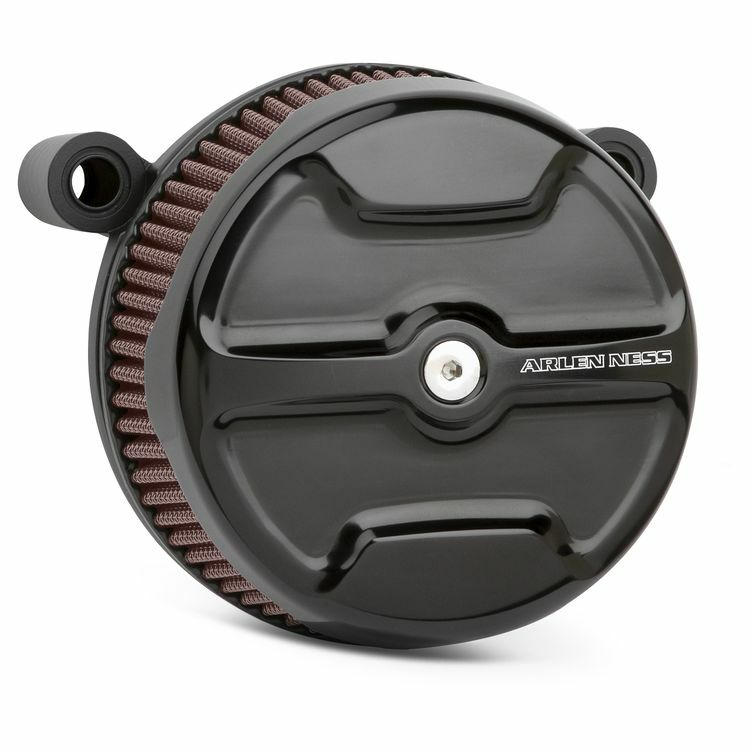 Note: 1999-2001 Touring models equipped with Magneti Marelli EFI require Arlen Ness Beveled Stage 1 Big Sucker Air Cleaner Kit For Harley Touring With EFI 1999-2001.